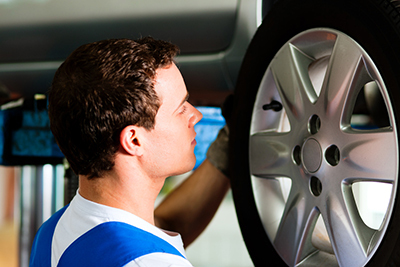 Although many drivers know they need their oil changed regularly, tire care can be as important, if not more so. Middletown drivers, when you need Honda tires, you know to visit our Middletown parts department, right? Of course, how do you know if you need new tires? How can you get new tires? When can you visit our dealership so we can put on your new tires? We’ve got answers to all of these questions and more; just keep reading! When you bought your current set of tires, they probably said they were good for a certain number of miles, which is under an ideal situation. Even if you are rotating them regularly and driving in good conditions, you may need to change your tires sooner than expected. One of the most common reasons Middletown drivers come to us for new tires is if theirs are wearing thin—less than 1/16 of an inch of tread depth. You can check at home by sticking the top of a penny into your tire tread. If you can see all of Abe’s head, you need new tires as soon as possible. If you notice cracks, cuts, bulges, or blisters in the sidewall of your tire, this can lead to a leak or a blow out and should be replaced immediately. If you need new tires, we will be happy to supply them. While we keep a variety in stock, sometimes your car needs a set of tires that we don’t currently have. Don’t worry; we’ll be happy to order parts for your Honda! Monday through Thursday from 7:30 a.m. to 7:30 p.m.
Friday from 7:30 a.m. to 6:00 p.m.
Saturday from 7:30 a.m. to 4:00 p.m. If you aren’t sure if your vehicle needs new tires or just want to learn what your choices are when you buy your next set, contact us at Middletown Honda; better yet, just drop by our dealership at 520 Route 211 East in Middletown.